Wrapped up another reading of Anne of Avonlea . Looking back at my "records" around here, I haven't read this title (or any of the Anne books passed Anne of Green Gables) since 2010. FIVE YEARS AGO!? How is that even possible? No wonder I'm craving Anne like nobody's business. It has been far too long. At sixteen Anne is grown up. . . almost. Her gray eyes shine like evening stars, but her red hair is still as peppery as her temper. In the years since she arrived at Green Gables as a freckle-faced orphan, she has earned the love of the people of Avonlea and a reputation for getting into scrapes. But when Anne begins her job as the new schoolteacher, the real test of her character begins. Along with teaching the three Rs, she is learning how complicated life can be when she meddles in someone else's romance, finds two new orphans at Green Gables, and wonders about the strange behavior of the very handsome Gilbert Blythe. As Anne enters womanhood, her adventures touch the heart and the funny bone. I hate the above description. Let's try this again . . . 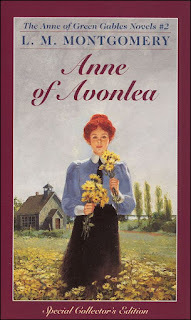 The book opens with Anne at age 16, about to launch into her teaching career at the local Avonlea school house. She is full of vim and vigor and glorious plans for how she will go about teaching. Anne always has high ideals. This is something that I can appreciate in her because whenever I start a new project, I usually have a lot of high ideals to go along with it. I've learned to reign in my enthusiasm (a little bit) and I do strive to look at things practically but sometimes my imagination and excitement for something just gets the better of me and I want to soar with all of my many and bright ideas. She enters her classroom and certainly has some class management skills to learn, but learn them she does. The majority of the book is not really about her classroom antics but about life as a whole. We are none of us one-dimensional creatures and thankfully Montgomery didn't write one-dimensional characters. The readers watch as Marilla takes in two additional orphans, Davy and Dora Keith. We witness Marilla and Anne working together to train Davy, in particular, as to how to behave and be a young gentleman. Anne has plenty of responsibilities between helping Marilla with chores, tending to kids, and teaching school, and yet she still finds plenty of moments to take off exploring around the Island. As a result of her affinity for the natural world, she stumbles into some right interesting characters who she begins to share life with. Chiefly, she meets Mr. Harrison, an apparent bachelor with a foul-mouthed parrot and Miss Lavender Lewis who is an imaginative older lady. Through Anne's interactions with both of them we see their lives and stories unfold in ways pleasing to the reader. My favorite character in this book is Miss Lavender. (I'm going to assume that my liking of her doesn't have anything to do with the fact that I'm loving all lavender flavored anythings these days.) I love how she and Anne connect and share the magic of an imagination. Their age gap does affect Anne's ability to understand Miss Lavender completely and yet the two of them overlook their differences in age and life experience and treat each other with the utmost care and respect. They genuinely love one another and I enjoyed every minute of the time they spent together, gathering wild strawberries or dressing up for tea, or enjoying the garden. When two people get along well - despite differences and ages - that just speaks to me somehow. We tend to put people in boxes and request and even require that people always interact with their own peers. All of my life I've made friends with people who are significantly older and sometimes significantly younger than myself. Of course, I do have friends that are my same age but I find that to be very rare and so perhaps that's why Miss Lavender's and Anne's friendship tickles me so. "I suppose that's how it looks in prose. But it's very different if you look at it through poetry . . . and I think it's nicer . . . " Anne recovered herself and her eyes shone and her cheeks flushed . . . "to look at it through poetry." I definitely lean towards the "poetical" speech when I'm describing something that I'm really excited about so I sympathize with Anne. I have always loved the conclusion of this particular book. Although the Amazon description makes you think that things are heating up nicely between Gilbert and Anne, that is simply not the case. It is clear to the reader that Gilbert is interested in Anne but it's also clear that she is not thinking of him in "that way." Romantic tension between them is lacking at this point. Gilbert is showing his cards slowly, wisely. Only on the last page does Anne begin to get a clue about what Gilbert might be thinking. When I was younger I always hoped that would be how love would unfold in my own life. Slowly. Born from friendship. And then I met Jonathan. First we harbored a (mutual) dislike of one another. We slowly became friends. Friendship, of course, turned to love but that also took a little time. In the end, I got my wish! I just didn't anticipate the dislike which started everything off. No complaints though. All's well that end's well as they say. I'm loving spending time with Anne again, if you couldn't tell. I'm glad to take a little bit of time to enjoy her all over again. Reading the Anne series is just pure bliss for me, that's what!